Desktop, 1-slot Thunderbolt 3 to eGPU Expansion System for eGPU-compatible GPU cards; also supports every other Thunderbolt-compatible card available up to full-length, full-height, and double-width. Features temperature-controlled fan, and one Thunderbolt 3 port. Thunderbolt Certified for Mac and Windows. Sonnet’s eGFX Breakaway Box, a Thunderbolt 3 to PCIe card expansion solution, supports any Thunderbolt compatible PCIe card, but is designed specifically for bandwidth-intensive video graphic cards. The Breakaway Box enables all the popular GPU cards that support connecting to a computer over Thunderbolt such as AMD Radeon® R9 and RX and NVIDIA® GeForce® GTX7, 9 and 10 series, providing GPU support for computationally-intensive applications and games. There’s no need to carry a heavy and expensive gaming laptop to have a great gaming experience—just plug in a Breakaway Box and add the GPU power you want when you need it! By delivering much higher frame rates for smooth game play, the Breakaway Box is ideal for enabling graphic-intensive gaming on computers (such as thin/light notebooks) that otherwise would not be able to produce an acceptable gaming experience. When used with computers that properly support eGPUs, accelerated graphics can either be displayed on your notebook’s own display panel or on external monitors. And, unlike with gaming laptops, when the next generation of GPUs rolls around and you are ready for another performance boost, simply upgrade the GPU card—nobody should have to replace their computer just to keep up with the latest in GPU technology. Desktop, 3-slot Thunderbolt 3 to PCIe Card Expansion System with integrated power supply, variable speed fans, and two Thunderbolt 3 ports. 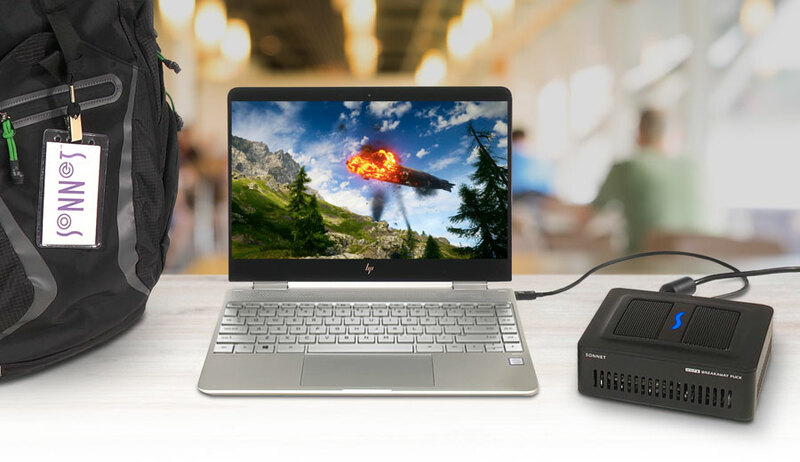 Portable eGPU for computers with Thunderbolt 3 ports. Features AMD Radeon RX 560 or RX 570 GPU, temperature-controlled fan, three DisplayPort ports, one HDMI port, and one Thunderbolt 3 port. Compact, desktop, 3-slot Thunderbolt 3 to PCIe Card Expansion System for up to three full-height, half-length+ PCIe cards. Features temperature-controlled fan, and two Thunderbolt 3 ports. 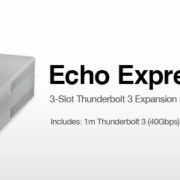 Sonnet’s Echo 11 Thunderbolt 3 Dock connects your peripherals to your computer through a single cable. Simply plug in your devices—such as a printer, keyboard, mouse, cable modem, hard drive, optical drive, USB license dongle, headphones or powered speakers, phone, tablet, and (up to) two 4K displays—to the dock with their supplied cables, and then connect your computer with the included Thunderbolt 3 (40Gbps) cable. The Echo 11 dock even charges compatible computers(5) through the same cable. When it's time to take your computer and go, just unplug the Thunderbolt cable to disconnect from everything at once! Compact, desktop 1-slot Thunderbolt 3 to PCIe Card Expansion System for a low-profile PCIe card; features temperature-controlled fan and two Thunderbolt 3 ports to support daisy chaining of up to six devices. Desktop, 1-slot Thunderbolt 3 to PCIe Card Expansion System for up to full-height, half-length+, double-width PCIe card. Features temperature-controlled fan, and two Thunderbolt 3 ports. Second Thunderbolt 3 port supports daisy chaining of up to five additional Thunderbolt peripheral devices, a single USB 3 Gen 1 (5Gb) or Gen 2 (10Gb) peripheral device, or one 5K or two 4K displays. Rackmount, 3-slot Thunderbolt 3 to PCIe Card Expansion System with integrated power supply, variable speed fans, and two Thunderbolt 3 ports.